This page provides you with Entrepreneur resume samples that you can use for inspiration in writing your own resume, or for creating one through our easy-to-use resume builder. Below you'll find our how-to section that will guide you through each section of a Entrepreneur resume. “You are an entrepreneur! Why would you need a resume?” How many times have you been asked this nonsense question by your peers, resulting in a lot of frustration on your side? Simply, they do not understand. Even entrepreneurs like you need a resume (actually, a standout resume!). Maybe you just want to know your worth in today’s market or perhaps all you want is to check if there are interesting positions out there that might change your mind regarding entrepreneurship and your future. If you are looking for the best entrepreneur resume sample, you have reached your destination! We will help you build the best resume an entrepreneur could ask for. We have already helped millions of people like you around the world: they asked, we delivered! Let us inspire you as well: onwards! You are or have been the mastermind behind the creation of a new business: you do not know what fear feels like! You have an outstanding amount of talents, from conceptualizing organizational operations, budgets and branding to implementing them through careful feedback and research. You have had stellar ideas and you most likely have outstanding leadership and motivational skills...and don’t forget about your exceptional problem-solving skills! As a business innovator, you have so many different and desirable strengths and your biggest challenge in creating a strong resume is to remain concise. One of the first steps you should take is to format the resume so that your strengths are highlighted, along with your best achievements. Ensure clear layouts are used to make sure the recruiters keep on scrolling down: white space and legible fonts make for easy reading and give the recruiters’ eyes a rest Last but not least, make sure you save your resume as a .pdf. We won’t have anything against you, Microsoft, but the Word formatting can sometimes be an issue whereas a .pdf is set in carbonite. Summaries don’t sound the most appealing or even necessary elements of a resume and yet they are needed. Most times recruiters don’t have the time to read every single detail of your resume and all they want is summaries. Make sure you captivate them with your most impressive business achievements and your excellent and unrivaled networking ability. DON’T (Summarize your life) - Try to be too funny, this is a professional resume - Use a smart or pompous tone in the summary. - Talk as if you are better than the recruiter. This section might get tricky - you have had a couple (or more!) of experiences working on your own business. The biggest mistake you could do is to say something like: “That business didn’t do that well, I should not include it”. That is so wrong - as an entrepreneur, you have worn so many hats that it does not really matter if you have failed, because you will never really fail as long as you have learnt from something. We suggest you list any experience you have had, as an entrepreneur and even any previous one as an employee. Show your future employer your level of experience and be as detailed as possible! Do (Summarize your work history) - Showcase why you are the perfect candidate for the job. - Be concise and detailed - Experience should be added where applicable. DON’Ts (Summarize your relationship history) - Bring your ego to the table. - Have more than 3 references at the bottom of the work history. - Fake references or work history is a no! For more tips on writing the best work experience section for an entrepreneur like you, check out our detailed resume guide. Which learning institutes you attended and what you studied. The outcome of the education – i.e. qualifications. It doesn’t matter if you’re only able to provide the most basic elements of your educational background, it still counts. Employers are often suspicious of people who leave their education out of a resume as it gets them wondering what they’re hiding. Even if it’s limited, it’s good to list and in truth, not everyone will have university degrees or education to list. If that’s the case, don’t worry, list what education you can. Recruiters aren’t going to spend hours and hours going through hundreds of resumes; they are going to use simple but effective methods to narrow their search down. One of the simplest methods they will use is to opt for a keyword search, which is why the skills you list must be relevant to the job at hand. Remember, if you aren’t using relevant keywords you won’t get far! We believe it’s fundamental that you add both hard and soft skills. These will make the difference and potentially get your name to the top of the list. Of course, if you start listing skills which aren’t really relevant to your job, we doubt you’ll get a callback, so think carefully before you list any skill! We really, really want you to get your dream job, and we’ve come up with some additional tips! DON’T (embarrass yourself) - Avoid adding information which might be sensitive about other businesses or organizations. - Avoid having a link to your Facebook, Twitter or Instagram accounts! - Sell yourself short. 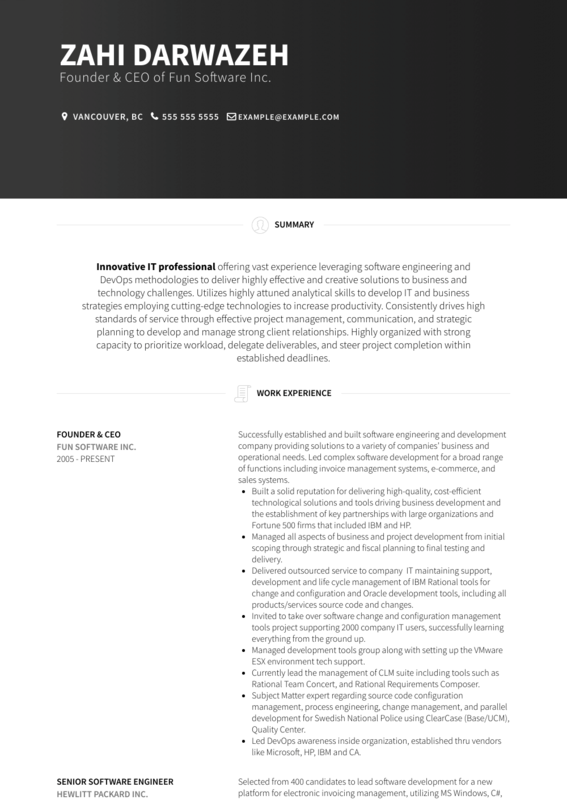 We have given you tips for the best entrepreneur resume sample: now, if you are also looking for the best entrepreneur resume templates, you should check this masterpiece we have been worked on [LINK to https://www.visualcv.com/cv-templates/] : many professionals like you have successfully used it to take their career to the next level.